On November 14, we’re releasing BACK ISSUE #61, a special 84-page TABLOID-SIZE ISSUE in FULL-COLOR, specially priced at $10.95 for this one issue only. It takes a BIG look at “Tabloids and Treasuries,” spotlighting the 1970s Bronze Age’s largest comic books. 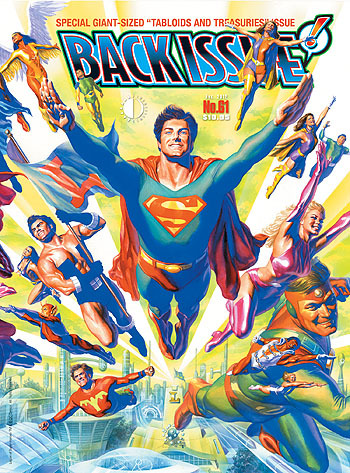 Articles in this issue spotlight behind-the-scenes details of every all-new tabloid comic book from the 1970s, plus a checklist of all the reprint treasury editions. Featured are Superman vs. the Amazing Spider-Man, The Bible, Captain America’s Bicentennial Battles, The Wizard of Oz, and more—even the PAUL DINI/ALEX ROSS World’s Greatest Super-Heroes editions from the early 2000s, which were a direct homage to those 1970s tabloids. There’s commentary from and art by NEAL ADAMS, JOSE LUIS GARCIA-LOPEZ, MIKE GRELL, JACK KIRBY, JOE KUBERT, SHELDON MAYER, JOHN ROMITA, SR., ALEX TOTH, and others, making this the most comprehensive look ever taken at those fondly-remembered oversize comics. And don’t miss ALEX ROSS’ reimagining of Mike Grell’s Superboy and the Legion of Super-Heroes Limited Collectors’ Edition wraparound cover; just stunning! You can download a free PDF preview HERE. This entry was posted in TNT on 23 October 2012 by Mr. Morrow.